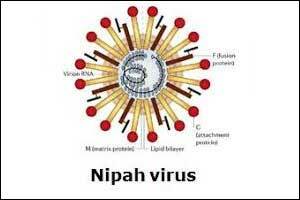 Thiruvananthapuram: A row erupted recently over the Nipah death toll in Kerala as an international medical journal stated that the deadly virus had claimed 21 lives, contradicting the official figure of 17 deaths. According to the state government figures, the Nipah virus has claimed 17 lives — 14 in Kozhikode and three in neighbouringMalappuram since its outbreak in May this year. However, a recent report published in the ‘Journal of Infectious diseases’ has stated that the total Nipah deaths in Kerala was 21. Interestingly, state health secretary Rajeev Sadanandan was among the experts who prepared the study report in the global journal. Reacting to media reports on the matter, Health Minister K K Shylaja said as per the government estimate, 18 people had tested positive for the deadly virus. The government had updated the death toll as 17 in July after including the death of Sabith, the first victim whose samples had not been tested for Nipah. The others had only showed symptoms of the deadly virus, but health officials could not confirm the infection as their samples were not collected, she told reporters in Kozhikode Saturday. It seemed that the journal, however, counted the suspected deaths also as Nipah deaths, she said. Sadanandan rejected the controversy over the study report and said there was no confusion over the figures. Of the total of 246 samples sent, 18 had been clinically confirmed as positive, he said. “When you are not able to check the samples, then it remains in the list of probables. When we verified the case records, four cases had been found as probables, but there were no samples,” he told PTI. “Thus there were a total of 23 cases. One index case (Sabith), 18 confirmed cases and four probable cases,” he said adding that the academic journal has its own criteria to prepare the report.